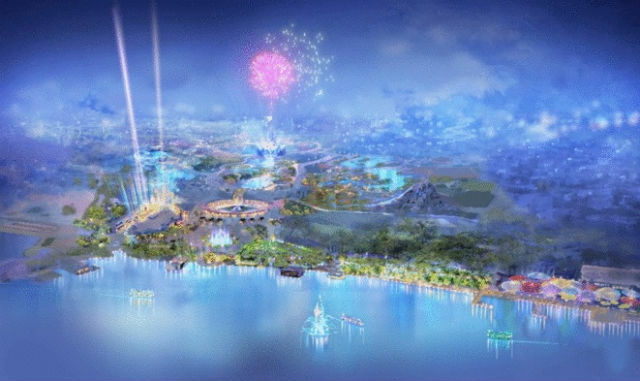 At an investor conference a few weeks ago, Walt Disney Company released official artwork of Shanghai Disneyland. The new park is set to open in 2015 (after they finish bulldozing people out of the way and sucking up Shanghai’s tourism budget) and is expected to draw 7.3 million visitors annually. From a strange Disney-obsessed corner of the blogosphere, we hear that our park is set to “break the mold”, whatever that can mean when talking about mass-produced consumer products.There will be no Main Street USA, and as astute observers of the drawing have noticed, there’s lots of pretty water and a mountain. Also, apparently we’re eventually getting three parks: Magic Kingdom is the only one confirmed, but rumors are of Epcot and an Animal Kingdom to follow. I am pleased that I discovered this blog , precisely the right info that I was searching for! .